As students gear up for state tests and finals, it’s time to start taking a look at how they study. Knowing how to study not only helps boost students’ performance on major exams, it also helps them go into the exam with confidence. Even students who already know how to study can stand to re-evaluate their skills to make sure they’re maximizing their brain power. 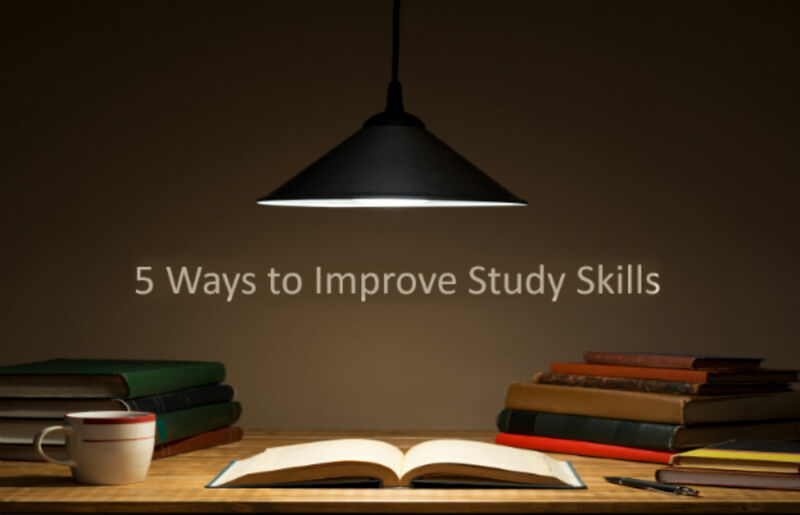 These strategies for improving study skills will not only help students learn how to study, they’ll also help make their study time more effective. Despite its popularity, cramming for an exam rarely works. Focusing on a lot of the same information at once may make students feel confident that they know it, but it usually doesn’t stick. Instead of cramming for exams, students should start studying early and gradually review the information over time. This helps them learn and review a range of information at once and in smaller amounts, making it easier for the information to stick. It also removes some of the stress because they can get a good night’s sleep the night before the test rather than staying up all night studying. Sometimes students know the basics of studying, but they don’t do it in the best environment. They may think they can study with the TV on and music blaring or while sitting in the library with their friends, but that’s not always the case. Students should conduct an honest and thorough evaluation of their study environment to see whether it’s really working for them. One way to do this is to read a paragraph in the normal study environment, test what they remember, and then switch to a quieter environment, read another paragraph and see if they remember more or less. What do I hear around me? Does it distract me from what I’m reading/doing? What do I smell around me? Does it make me feel positive or negative? How is the lighting? Is it too dark? Too bright? Am I comfortable? Too comfortable? Do I have all the resources I need around me? What objects/sounds/smells/etc. take me away from my studying in this environment? Answering these questions will help students determine whether their study environment is working and what they need to add or remove to create the optimal study environment. Of course students can study all they want in their optimal study environment, but it won’t do any good if they don’t know how to study. Studying involves more than re-reading highlighted notes or flipping through a stack of flashcards. HowtoStudy.com offers a guide to help students learn how to study. The guide covers aspects of studying such as creating a study plan, taking effective notes, managing stress, and learning how to effectively study and brush up on your skills before a test. While the guide has been designed for college students, many of its principles also work well for students in middle school and high school. Too often students get to college without knowing how to study, so it’s good to teach them how to study while the stakes are lower and they have their parents and teachers around to support them. When students have trouble with a subject and develop a negative attitude, no amount of studying will work. Instead, the negativity will overpower most of the learning that takes place. The goal of studying is to help students learn to master difficult concepts and become more confident in the material and they must approach studying with that mindset. 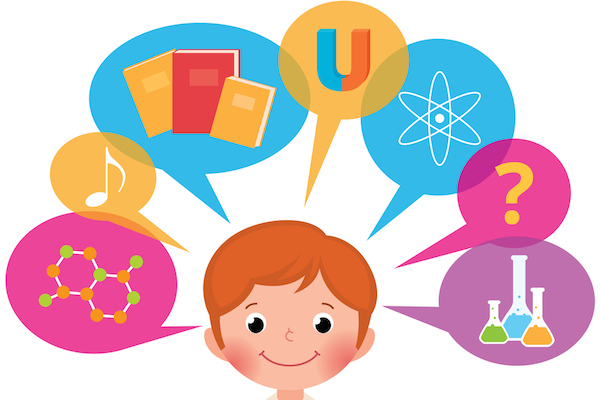 Parents and teachers can help encourage students to think positive by encouraging them with phrases such as “I know you can get this” or “you’re almost there.” Adding motivational quotes, posters, or other positive pictures and phrases to the study environment can also help students subconsciously think more positively about themselves and their abilities. When studying, students also shouldn’t start with the most difficult material they need to learn. Instead, they should start with easier material so they experience success early on and, therefore, are more motivated to keep going. Study skills worksheets and organizers, like those found as part of Help Teaching’s free printables collection, can help students learn the key words, vocabularies, and strategies needed to become better at studying. These worksheets will also help students by helping them with concepts such as creating a study calendar, learning what foods to eat while studying, and even just getting a handle on the vocabulary related to studying. AcademicTips.org covers the basics of studying and offers other resources, such as inspirational stories and funny jokes, to help students de-stress and feel confident while studying. The How to Study Infographic from Rasumussen College breaks down the basics of studying, including research-based facts on the optimal studying strategies. Study Guides and Strategies provides hundreds of free guides designed to help students learn to study and provide them with material to study related to major subject areas. HowToStudy.org organizes its study skills by subject, showing students that sometimes they must study different for a math test than a science exam. Have some study tips or resources that you love? Share them in the comments. For many high school juniors and seniors, the SAT causes a lot of stress and anxiety. In their quest to get the perfect score, they’ve turned prepping for high stakes tests into a multi-billion dollar industry. While there’s some value to the expensive prep courses and gigantic test prep books, you don’t need a fancy program to help you improve your score. In many cases, you can ensure you do well on the SAT by doing some free prep work at home and using some key strategies while taking the test. 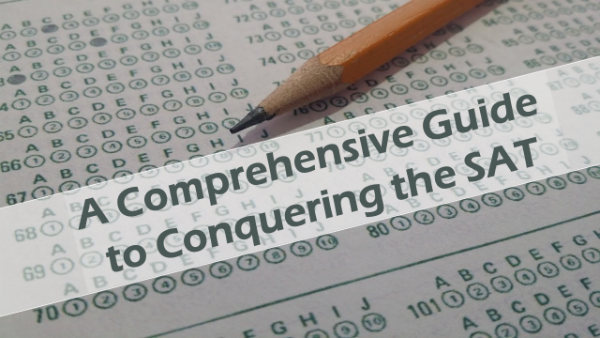 We’ve rounded up some of the best tips to help you conquer the SAT. One of the best tips for doing well on the SAT, or any other big test, is to get to know the format. Do you know how many sections are on the SAT? Do you know how many questions you have to answer in each section? Beyond that, you need to know how the questions are asked. For example, you’ll be asked to answer 13 student-produced response math questions. You’ll also have to know how to read the underlined portions of the passages to answer the writing and language questions. The current test does not have a guessing penalty, so it is better to answer every question, even if you have to guess. Use the process of elimination to eliminate at least one answer choice and improve your odds of getting the question correct. Don’t spend a lot of time during the test looking at the clock, but as you practice for the SAT learn each amount of time feels like. If you’re spending too long on a question, move on and come back to it at the end. Consider bubbling at the end of each section or page so you don’t have to flip back and forth between the test and answer sheet. This will buy you some time. Just circle your answers in the test booklet and flip to the answer sheet at the end of each section or page. If you have time, go back and make sure you bubbled in the correct answer for each problem. Circle the answers in your test booklet to make this process smoother. Immediately after you read a question, take a second to see if an answer comes into your head. Then read the answer choices. If the answer you came up with is one of the choices, chances are it’s the right answer. Many questions contain key words that tell you what to do. Underline these words to help you stay focused as you answer the questions. Make sure you answer what is being asked. The most obvious wrong answer will always be one of the answer options, so it’s easy to get tripped up. You can easily get caught into the trap of second-guessing yourself. If your gut says it’s correct, then stick with the answer and move on to the next question. It doesn’t matter how prepared you are for the SAT; if you’re stressed out, you won’t perform as well. The day before the test be sure to get some sleep and take some time to do something fun. Go see a movie. Play a video game. Hang out with your friends. Don’t spend all your time thinking about the test. Taking practice tests is an important part of preparing for the SAT. Don’t just sit and click through sample questions online. Instead, print out or get a practice book that has multiple practice tests in it. As you complete each test, try to mimic test day conditions, including following the time limits, using an answer sheet, and creating a test-like atmosphere. When you’re finished with a practice test, score yourself. For any questions you missed, before reading the answer explanation, see if you can determine how to come up with the correct answer on your own. Also look over your answers and see if you can find a pattern of errors. Did you miss certain question types or specific math or ELA skills? If so, you know that you need to brush up on those areas before test day. The SAT largely measures language arts and math skills. The reading and writing sections have changed over the years. Not only has an optional writing section been added, but the emphasis on definining higher-level vocabulary words and completing analogies has been decreased. In the reading section, you’ll be asked to read high-level passages and answer questions. In the writing section, you’ll be asked questions related to grammar, spelling, conventions, and general writing techniques. If a question is passage-based, it helps to have a purpose for reading. Look at the questions related to the passage before you start reading so you know if you’re looking for parts of the passage related to a particular idea or character. While you can’t talk loudly during the test, you can whisper the sentences that are part of grammar questions to yourself. Often you’ll hear an error better than you can see in on the page. In reading and grammar, connotation and context play a large role. By looking at both, you may be able to distinguish between two very similar answer choices and choose the correct one. The SAT question writers are not trying to trick you with grammar questions, but they may include some very small errors in answer choices to make them incorrect. Pay close attention to punctuation marks, plurals, pronoun-antecedent agreement, parallel structure, and subject-verb agreement. Question writers work hard to avoid cluing (where one question gives you the answer to another) in a test, but sometimes, particularly in evidence-based questions, you can often find some help. Often there’s a lot of useful information in the short paragraphs that introduce the passages and questions in the reading and writing sections. There can be a lot of helpful information in the instructions on other parts of the test too, so make sure you read all of them carefully. For more help with the reading and writing questions on the SAT, use Help Teaching’s SAT worksheets to brush up on your vocabulary, identify sentence errors, and read some SAT reading passages. The math section of the SAT has both multiple choice and open-ended math questions. There’s also a section where you’re not allowed to use a calculator. The open-ended format can see intimidating, but if you prepare for the test, you can feel confident in your answers no matter what type of question is asked. When answer choices do not have numbers, rather equations or expressions, you can still plug in a logical number and see which one works. Pick a logical number or numbers if needed. For example, 1 is a good starting place, 100 if you are dealing with percents, multiples of 10 if angle measures, etc. Substituting the answers choices in for variable is a huge time saver – “plug and chug”. You’re looking to get the correct answer as efficiently as possible, not please your math teacher! Sometimes a question masquerades as something more complex when all you really need to do is simplify it. For example, an improper fraction may reduce to a whole number. These include the Pythagorean Triple (3-4-5 and 5-12-13 specifically). Remember that any multiples of those numbers are also triples (6-8-10, 10-24-26). You can also brush up on special right triangle rules or other ones learned in school. Draw a picture, graph, table, diagram whenever you can to help visualize the problem. The SAT will give you a reference sheet with common formulas, but it’s time-consuming to constantly take it out and refer to it. If you are familiar with common formulas, you can answer most of the questions on the test without referring to the formula sheet. In addition to the tips above, you can find resources to help you prepare for the SAT on Help Teaching’s SAT Preparation Resources page. Still worried you won’t do well? Don’t stress. Not all colleges require the SAT or ACT. Check out FairTest to discover a list of colleges and universities that are “test optional” or “test flexible” when considering students for admission. We are very e xcited to announce the release of a brand-new version of StudyLock, an educational application that helps parents manage how their children interact with their smart devices for which Help Teaching is the exclusive content provider. StudyLock is an intelligent educational system from Big Mage Studio, a talented and experienced developer with a great talent for designing engaging apps that kids love, that locks selected apps and games on the children mobile devices and only gives access after they answer a series of educational questions specifically selected for their grade. The questions available through StudyLock are geared for children and teens in grades 3-10. The questions kids and teens must answer to unlock their devices are all provided by Help Teaching’s content contributors. Our contributors have over 20 years of combined teaching experience and are committed to providing the highest quality of content for use by StudyLock™. It’s the same high-quality content you’ll find as part of Help Teaching’s premium printable worksheets and lessons. Questions are broken into five categories: math, history, science, language arts, and health. All math and language arts questions are aligned to the Common Core State Standards too, ensuring that the content is focused on the knowledge and skills kids need to know. 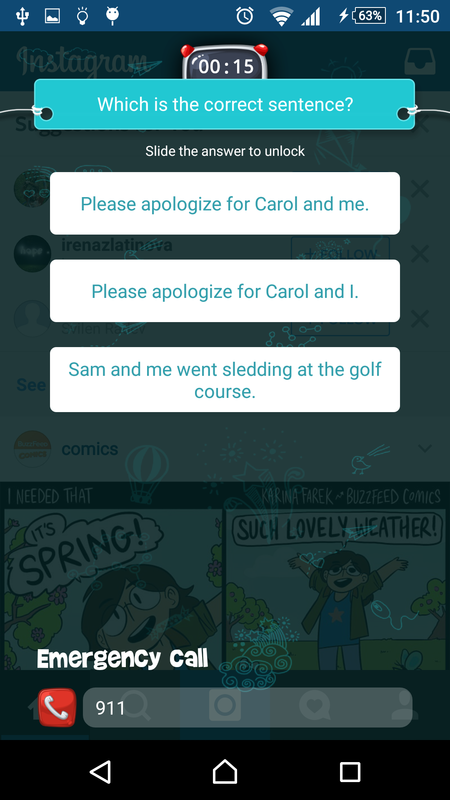 Parents can also create custom questions that are specific to their child needs. Through their partnership, StudyLock and Help Teaching provide parents with a comprehensive resource to monitor children and teens’ academic progress and provide them with tools to improve their skills. Parents can choose to have progress reports e-mailed to them and quickly see which standards their kids and teens need the most help with. Once parents determine where their kids need the most help, they can head over to Help Teaching to discover more resources to help them improve their skills. The StudyLock app is free to download from Google Play or the Amazon app store and is supported by all Android devices – smartphones and tablets – running Android 4.1 or higher. For more information about StudyLock, visit http://studylockapp.com/. If you would like to support StudyLock and its mission, you can do so via the StudyLock Kickstarter campaign.